I was at work for 11 hours today supporting an important event. Catered meals are one of the only enjoyable aspects about these kinds of activities and today we had a variety of options from Pick Up Stix for lunch. The food was pretty tasty, and we ended our meal with the usual fortune cookies. My co-workers each opened theirs and read the fortunes to the group. Most were encouraging but vague phrases about something like friends or trusting your instincts – exactly what you’d expect from mass-produced products meant to satisfy a wide variety of consumers. I was anticipating something similar from my fortune as I cracked open the cookie and pulled out the tiny slip of paper inside, but when I read what was written on it I was completely taken aback. It said, “Your judgement [sic] is a little off at this time. Rely on friends.” WTF? Did I just get insulted by a fortune cookie? Luckily I was in a positive state of mind so my first reaction was amusement. I found it so hilarious that I could barely compose myself enough to share it with my co-workers. They were all flabbergasted as well! Who in their right mind thought to put such a pessimistic statement into a fortune cookie? At least we all got a good laugh out of it, which was very therapeutic after our trying day at work. So maybe it wasn’t such a bad choice after all! P.S. I decided to highlight my dubious judgment by photographing the fortune in question surrounded by my still not put away Christmas decorations. 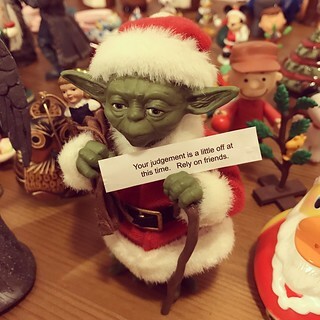 As you can see, Santa Yoda doubts my judgment too.